A scene from “Champion,” directed by Kevin Reyes, one of the works featured at CSUN's annual "Senior Film Showcase" last year. The Hollywood Foreign Press Association has awarded CSUN $2 million to support students in the university’s acclaimed Department of Cinema and Television Arts. The Hollywood Foreign Press Association (HFPA) has awarded California State University, Northridge $2 million to support students and enhance technology in the school’s acclaimed Department of Cinema and Television Arts. A portion of the grant will go toward creating endowed scholarships to support underrepresented film and television students in the industry. Scholarship recipients will be declared Hollywood Foreign Press Association Scholars and be mentored by department faculty and industry professionals. HFPA President Lorenzo Soria expressed his enthusiasm and hopes for what the grant bestowed upon CSUN will bring. 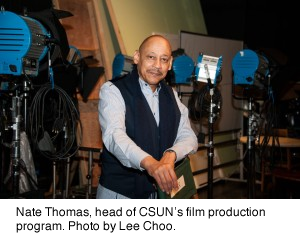 Cinema and television arts professor Nate Thomas, who heads CSUN’s film production program, hailed HFPA’s generosity. To date, the HFPA has committed more than $23.9 million in grants, handed out over 1,000 scholarships and helped restore 90 films. Last summer, the HFPA continued their long-time tradition by awarding more than $2 million in grants at their annual Grants Banquet. The donations benefit a wide range of projects, including higher education, training and mentoring, and the promotion of cultural exchange through film. CSUN’s relationship with the association dates back to 1996, with an initial gift of $500. Prior to this announcement, the association over the years has nearly given CSUN a total of $1 million to support student film projects and keep CSUN’s film program current with the latest technology. Students edit in the Hollywood Foreign Press Association Senior Film Edit Suite on campus, and work on sound design in a state-of-the-art sound mix facility made possible by a grant from the association. Dan Hosken, interim dean of CSUN’s Mike Curb College of Arts, Media, and Communication, which houses the Department of Cinema and Television Arts, agreed. CSUN’s Department of Cinema and Television Arts has an international reputation for producing dedicated and talented entertainment industry professionals who recognize the value of hard work as they learn and continue to perfect their crafts. The department currently enrolls nearly 1,700 undergraduate students and 30 students in its graduate screenwriting program. Its alumni work in all aspects of entertainment media, from writing, producing and directing to manning cameras and having the final say in what project is made. In 2014, The Hollywood Reporter listed CSUN as one of the top film schools in the U.S., and this year, Variety listed CSUN as one of the top 30 film programs in the U.S. and one of the top 40 film programs internationally. Serving more than 40,000 students each year, CSUN is one of the nation’s largest single-campus universities in the U.S. and is the third largest in California. CSUN ranks 10th in the country in awarding bachelor’s degrees to underrepresented minority students, fifth nationally in awarding master’s degrees to Hispanic students, and it enrolls the largest number of deaf and hard-of-hearing students of any U.S. state university. Founded in the 1940s during World War II, the HFPA was originally comprised of a handful of LA-based overseas journalists who sought to bridge the international community with Hollywood, and to provide distraction from the hardships of war through film. Seventy years later, members of the HFPA represent 55 countries with a combined readership of 250 million in some of the world’s most respected publications. Each year, the organization holds the third most watched awards show on television, the Golden Globe® Awards, which have enabled the organization to donate more than $23.9 million to entertainment related charities and scholarship programs. For more information, please visit www.GoldenGlobes.com and follow us on Twitter (@GoldenGlobes) and Facebook (www.Facebook.com/GoldenGlobes).